By the time you’ve tucked your kids away in bed, you’re usually ready for well-earned rest! But before you plant that final kiss, there’s one more thing you need to do: read a bedtime story. The Melbourne Institute of Applied Economics and Social Research and The Cincinnati Children’s Hospital all say both literacy and numeracy skills increase in children who are read to three to five times a week. Reading a bedtime story is a little like putting money into the bank and watching it grow. Here are five reasons you should be reading a story to your little one before turning out the light. 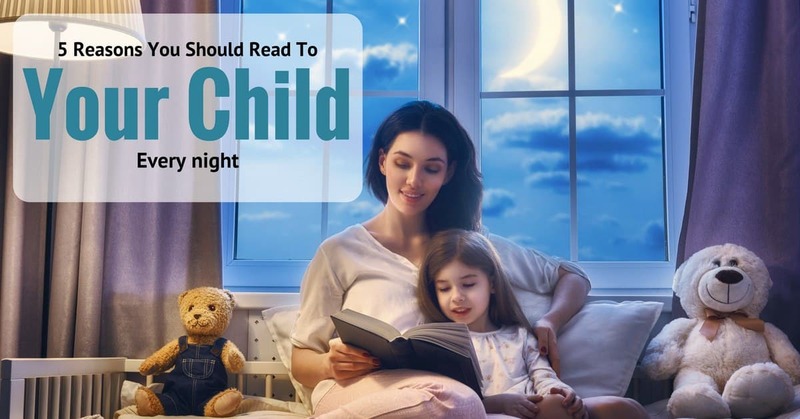 Reading a chapter to your child before bed is an excellent one-on-one time. There’s no e-mail, housework or television to create a distraction: just the two of you escaping on some fantastical adventure together. The older your child grows, the harder it is to find distraction-free quality time, so reading each night is a wonderful way to strengthen your bond and give the two of you something to be excited about together. Exposing your child to language is proven to help expand their vocabulary. Your child will be introduced to new words and different ways to use the ones they already know. An increased vocabulary can improve confidence. Being bold with language has a positive social effect in children–your child will feel smart and confident when speaking both at home and in the classroom, eliminating potential frustration. Children’s books love a good moral! Rabbits get bullied by pink elephants, a cheeky duckling learns the value of honesty, and the list goes endlessly on. Each night you’re reading together, you’re teaching your child the value of right and wrong. You’re teaching about the importance of kindness and why they should think about others. The best part is that these lessons are demonstrated in practical ways your child can understand, not as stern lectures from an adult. Escaping to new and fantastical worlds within the pages of their favorite book will help your child learn to use their imagination. Watch as the pages from a book come to life outside in the backyard, or a carefully drawn crayon picture. Your child will learn to concentrate and listen carefully to the descriptions you’re reading to re-create the images in their mind. This is a fundamental skill in being creative, one which you will appreciate each time you receive a homemade birthday card! You may have forgotten just how much fun it was to read about Fantastic Mr. Fox outwitting Farmer Boggis, Farmer Bunce, and Farmer Bean, but reading to your child each night will reintroduce you to all those wonderful classics you enjoyed so much as a child. As an adult, your life is filled with important “adultish” thoughts, but going on an adventure with your child every night can be just as fun for you as it is for them. Fun-time is always significant for your child, but it’s essential for you as well, so what better way to treat yourself than by becoming reacquainted with a few of your own childhood literary friends! One of the most important jobs of a parent is to provide their children with the tools necessary to grow into a good human being. Reading offers valuable educational, social and emotional learning tools that research has shown will provide your child with a strong foundation from which to grow. Five minutes of reading a night can make a pretty big difference, for your child, and you. You can ask your school librarian for suggestions of books to check out from the school library or check with the children’s librarian at your local library for ideas. Get a family library card. You can also find excellent books for children of all ages at Amazon.com.